In Covenant Keepers, Wendy Watson Nelson uses the scriptures, and examples of those who have taken the Lord at His word and put His doctrine to the test, to offer us invigorating insights into the baptismal, sacramental, and temple covenants. Wendy Watson Nelson, PhD., takes the reader through a short study of the definition of what constitutes a covenant, its symbolic representation in LDS living, and its literal binding spiritual contract between a man and God. With the use of an experiment that readers can implement in their lives, they will realize a greater understanding of the depth of meaning to, as well as individual empowerment through, and accountability for the covenants they have made with God. The author also extends a sincere invitation for all individuals to pursue righteous living, covenant making, and covenant keeping. Though this book primarily holds a greater appeal to the population of readers belonging to the Church of Jesus Christ of Latter-Day-Saints, its basis in universal beliefs of Christianity about the nature and purpose of covenants between man and God will appeal to a larger audience as well. With references to ancient and modern-day prophets and scriptures, the author illustrates how covenants between man and God have existed throughout all time and even before the measure of mortal time. Through the use of a 21-day experiment, readers are encouraged to implement a personal sacrifice of time, void of worldly influence and distraction, in exchange to increase their time participating in family history and Temple work. In doing so, this effort will, in effect, grant the participant greater ability to manage their personal life, gaining a greater perspective. The author also discusses how blessings come to individuals in various ways throughout their life, but distinguishes that the very best blessings (those of greatest eternal significant and those that provide eternal happiness) come as a result of making and keeping sacred covenants. Having been a member of several faiths at various times in my life, I found this explanation to be easily understood, and I felt that many readers of various faiths would likely be in agreement with this. Additionally, the author illustrates how parents prepare their children to make and keep sacred covenants by teaching them about making promises in terms that they can readily identify and apply. I also felt that parents of various faiths would see this as a point of truth. For me, one of the most poignant parts of this book was the concept that covenants are a “privilege,” and that living righteously and keeping those covenants yields a promise that the angels of heaven can be petitioned to help us or those that we love. Again, with my extended family members belonging to various faiths, I found this to be a point that has been discussed at times and embraced as truth, with confidence thereof, supported by scripture. The author clearly explains the accountability that one has after entering into a covenant, to let those covenants influence their daily life choices. Additionally, by associating with other individuals who have made similar covenants, and are making efforts to keep those covenants, individuals can help encourage and support one another in that effort because of a mutual understanding and mutual value system. To keep oneself securely on the path of being a covenant keeper, the author suggests that individuals set aside distractions and things of the world that don’t matter and replace that with things of eternal consequence. In that effort, the author stresses that focusing on family history work is a rewarding partnership between man and God. Furthermore, it is especially so when those efforts are culminated in the Temple ordinances related to it, specifically, within the Temples of the Church of Jesus Christ of Latter-Day-Saints because of the Priesthood keys, authority, and power of Jesus Christ to perform those proxy ordinances. The author acknowledges that all people have challenges with achieving balance in their lives and it’s of paramount importance to focus on things of significance. To achieve this, she suggests by daily focusing on the words of the covenants, individuals can continually renew commitment, helping one to achieve that sense of balance and bring greater purpose, direction, and joy to their life. In conclusion, the author illustrates the divinity within all persons and extends the invitation for all to pursue righteous living, covenant making, and covenant keeping. I found this invitation to be reflective of the inclusive nature of the Savior’s teachings during his mortal ministry, and it pleased me. I found the overall content of this book to be enlightening, educational, inspiring, inviting, and motivating. I give this book a positive recommendation for reading. Covenant Keepers is thought provoking, peacefully inspiring and incredibly motivating. My husband and I read this together. We loved the personal experiences that make this book relatable and surprisingly enjoyable to read and re-read. This book has compelled me to pay better attention to what is most important... our covenants. Sister Nelson's words are simple but powerful and profound. In this book, she has laid before us the way to get the most out of life... the ultimate treasure map... the way to finding true happiness and an abundance of blessings. She kindly encourages us to embrace our responsibility in the Lords work and teaches us how we can make the most of our lives and our time as latter day saints. She states, "Imagine what can happen as we make a sacrifice of time to the Lord by doing two things we know He really cares about: Family History and Temple Work." If you are looking for that extra encouragement to begin your genealogy or even if you aren’t, this will push you over the edge (in a good way). If you are looking to get a bit more from your temple experience, your baptismal covenants, the sacrament or Sunday worship, you've found it. Worth the read, but read it free. I'm sure it makes a beautiful table book in hardcover. This book is so inspiring, concise and to the point of how important it is to do Family History and Temple work. I have been doing both for many years but was not aware of all the help we can receive from the other side of the veil. I have read it 3 times and will continue to read it over and over again. Sister Nelson is such a wonderful writer. She packs a punch in all she has written. She inspires me to be a better person and a better convenant keeper. 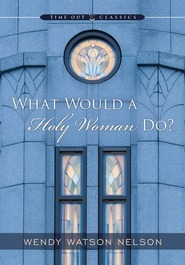 Thank you Sister Nelson for writing this book! I was impressed to buy this book, after seeng a short excerpt. I didn't really know what it was about. I've been brought to tears as I have read. I am teaching our young single adults at a regional conference about family history this weekend. I had been praying to know what to teach. This book was an answer to my prayers. Thank you! I can't put it down! I am ordering one for my daughter as well as multiple copies to spread throughout our stake. Elder Eyring said the Holy Ghost is what changes hearts. The Holy Ghost will testify of the truths in this book and change hearts, turning them to their fathers and to the temple. This is a great book even for those who do not like to read. It's brief and yet packed full of wonderful insights, one of which is praying for Heavenly Father to allow an angel - mostly one of your relatives/ancestors who have passed on - to assist you. I'm so very grateful for Sister Nelson writing this book. It would be a great gift for anyone for any occasion.